Product Description This 10 gal (44L) DHA-1000 ultrasonic cleaner is a self-contained unit which consists of a powerful ultrasonic generator, a stainless steel cleaning tank and an array of durable industrial style 44 kHz transducers. These transducers provide increased cleaning power and ensure uniform cleaning activity throughout the bath. The unit includes heaters and controls to raise the bath temperature for improved cleaning activity. The DHA-1000 incorporates a drain and delivers precise cleaning quickly, consistently, and cost effectively. - Larger or multiple printed circuit boards. - On/off heat switch - heats up to 140°F. 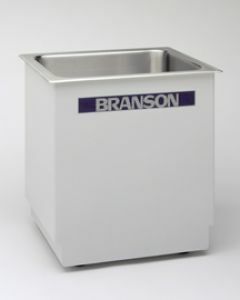 - Deep-drawn stainless steel tank with rounded corners for easy cleaning. - Ultrasonic generator, transducers, and cleaning tank in one compact unit. - Convenient analog controls mounted below a drip lip - within easy reach, but away from the solution. - Requires only electrical connection for full operation. Designed especially for medium and heavy duty industrial applications. Solution capacity is 10gal. Suitable for use with alkaline, mildly acidic, neutral or caustic aqueous solutions. 304L stainless steel tank. Heated with 1000W heater power. Basket & cover are extra cost. An interior tray (available in solid stainless steel or perforated) or basket will be required at extra cost as you cannot put items directly on the surface. Basket & cover are extra cost. An interior tray (available in solid stainless steel or perforated) or basket will be required at extra cost as you cannot put items directly on the surface.